Mountain Hiking Holidays Blog: It's Summer Now in Patagonia! It's Summer Now in Patagonia! It's February! For many of you, winter rules the month. February signals cold temperatures and long dark nights. About 88% of the world's population lives north of the equator. Bill Rankin's blog Radical Cartography has two great visual maps of the population of our planet that clearly illustrate this congregation of people north of the equator. However, south of the equator, February is summer! Think of your favorite holiday in December, January, and February. Now picture your gathering with summer temperatures! For three decades, we have flown south, across the equator, and experienced the joy of flipping seasons down under! A wonderful swim on New Year's Day at Wilson's Promontory National Park in Australia. Wearing winter coats in August in Santiago, Chile gazing up at the snow-clad Andes mountains. Hiking to the brink to watch the Zambezi River plunge over the precipice at Victoria Falls in Zimbabwe. And departing our home in Portland, Oregon nearly every year since 2008 to lead our hiking trip in Patagonia. February is, in our opinion, one of the best months to hike in Patagonia. Fly into Buenos Aires, Argentina where the average monthly temperature in February is 81 degrees Fahrenheit (with a low of 68 degrees). Your day is illuminated with more than thirteen hours of daylight. Another flight, from Buenos Aires to El Calafate, Argentina, takes you nearly 3,000 miles further south, close to the tip of South America. Here at the foot of the mountains in Patagonia the average monthly temperature in February is 65°F for a high, and 46°F for a low. The summer crowds in the national parks of Patagonia peak in December and January, so now in February you'll have arrived at the shoulder season with the weather is showing hints of the transition from summer to fall. Hiking in Patagonia in February does however remind you that regardless of the season, mountains create their own weather. Positioned at the southern end of South America, the mountains of Patagonia in Chile and Argentina bear the brunt of the weather fronts that arrive from the Pacific Ocean to the west and sweep across the continent to the Atlantic Ocean in the east. The skies above Patagonia are a great place to see lenticular clouds—those lens-shaped clouds formed when high winds aloft and the moisture they carry meet the Patagonian mountain barrier. Officially known as Altocumulus Standing Lenticular (ACSL) clouds, they are spectacular! Paolo and others trying to stand up in the wind. 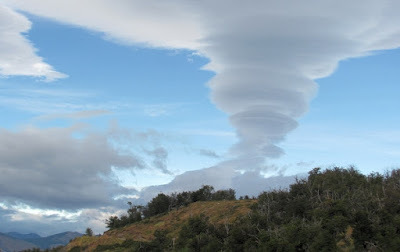 Lenticular clouds at the Brazo Rico, Los Glaciares National Park, Argentina. 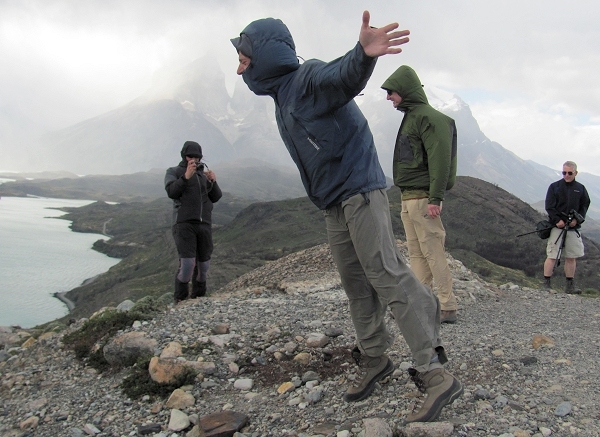 Braced against the winds of Patagonia in Torres del Paine National Park. However, unlike the northern Andes in Peru and Colombia (where hikes may be at elevations of over 10,000 feet) in southern Patagonia you are frequently sleeping closer to sea level and hiking at elevations of about 3,000 feet. 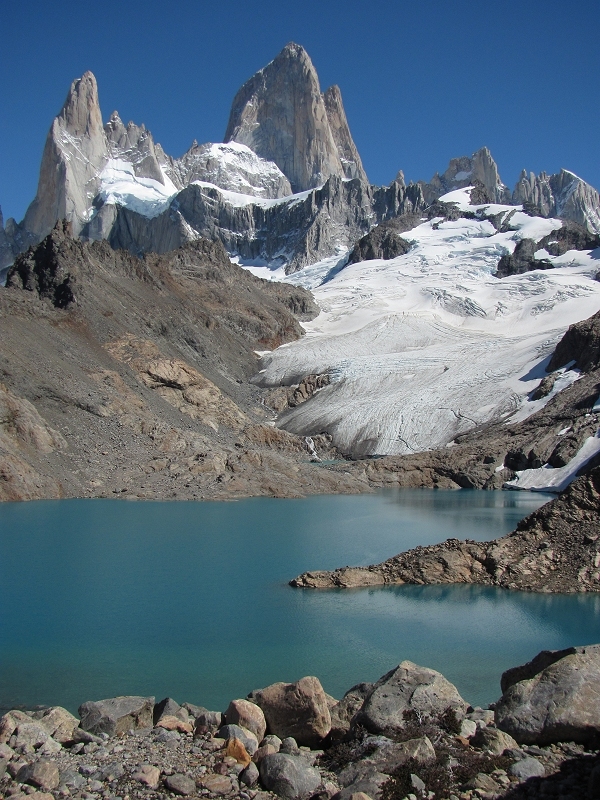 For example, El Chalten (Argentina's "trekking capital") sits at 1,350 feet above sea level. A favorite hike to view nearby Monte Fitzroy brings you to the shores of a mountain lake (Laguna de los Tres) nestled at an altitude of 3,800 feet. 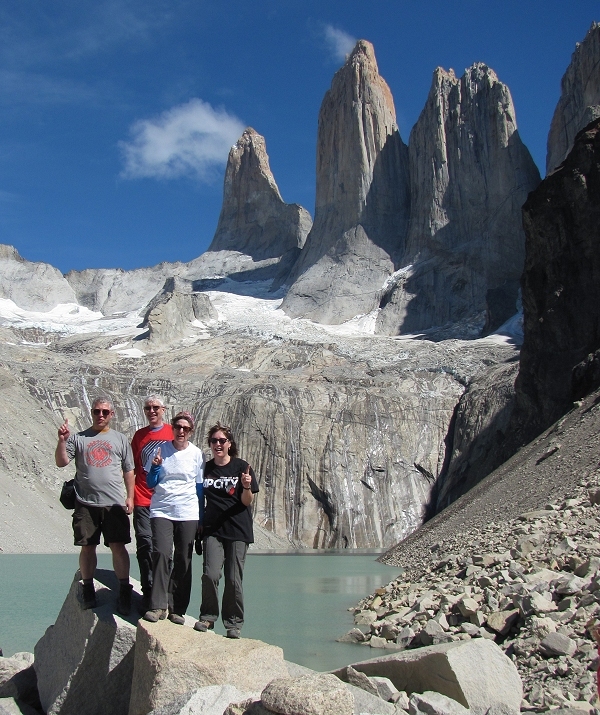 Across the border in Chile, at the the Mirador las Torres (where you can enjoy and spectacular and iconic view of the Torres del Paine) you are standing at a mere 2,800 feet above sea level! Laguna de los Tres, Los Glaciares National Park, Argenitna. Elevation at this viewpoint: 3,900 feet. Mirador las Torres, Torres del Paine National Park, Chile. Elevation at this viewpoint: 2,800 feet. It is imperative that you be fully prepared to meet Patagonia’s weather on its own terms particularly since you will be spending so much time out of doors. In order for you to be warm, comfortable, and safe please assure that your outdoor wear is of high quality, in good repair, and up to the task of fending off the region’s unpredictable weather. Be particularly attentive to preparing yourself for wind—even on sunny days, strong, steady winds are characteristic. In general, you can expect summer weather in the Patagonian mountains to be “unsettled” with cool temperatures and ever-present wind. Chance of rainfall generally increases the closer you are to the mountains. By contrast, towns built on the Patagonian steppes (like El Calafate) enjoy generally drier weather. Clouds can be persistent over the high peaks obscuring views. At the same time, massive lenticular clouds (common in the area) are a visual delight in themselves! The average summertime temperature in the Los Glaciares (Argentina) and Torres del Paine (Chile) National Parks is about 69°F with lows averaging about 40°F. Whether you join us on the trail in Patagonia in February, or pick another destination south of the Equator, we hope you go and enjoy the pleasure of experiencing life "down under"! Happy travels and happy hiking!